We’ve seen in this series that blinding using the arcsine function on a calculator is insufficient for finding all solutions of an equation like . 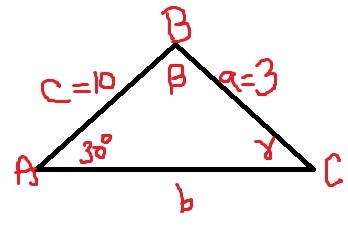 In today’s post, I discuss one of the first places that this becomes practically important: solving the ambiguous case of solving a triangle given two sides and an nonincluded angle. Solve if , , and . The red dashed circle with center illustrates the dilemma: “side” is simply too short to reach the horizontal dashed line to make the vertex , dangling limply from the vertex . 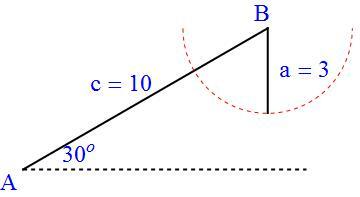 Since must like between and (said another way, is undefined), we know that this triangle cannot be solved. In the next few posts of this series, I’ll consider the other SSA cases — including the case where two solutions are possible.